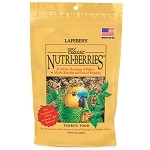 Home > Food & Treats > Parrot Food Blends > Lafeber > Avi-Cakes - Fruit Delight for Parrots - 8oz. 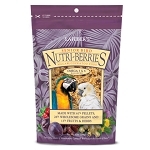 Avi-Cakes - Fruit Delight for Parrots - 8oz. 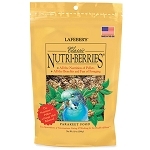 Lafeber's Avi-Cakes Fruit Delight Bird Food explodes with tastes in this collection of fresh seeds, fruits, grains, and more. Break off a bite for reward training or bonding opportunities. Or, give them the foraging exercise and excitement that they love. 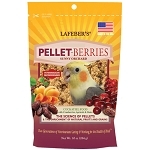 With 50% pellets and 50% fruits and grains, this bird food is 100% nutritionally complete and omega 3and 6 balanced. It is naturally flavored, naturally preserved and makes for an excellent conversion food. NOTE: The Fruit Delight AviCakes are much harder than the regular AviCakes. 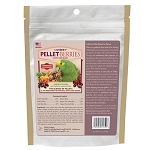 My SI Eclectus won’t eat much fruit, but loves these treats! Always good, always thorough, and swift, Birdsafe Store. New flavor for our Moluccan, Tuki. This is his bedtime snack food. He loves it. I can only repeat what my goffin says: "Mmmmmm" he says when he is eating them. Ingredients: Corn, red millet, hulled canary grass seed, hulled white millet, malto-dextrin, soybean meal, safflower, wheat flour, sugar, acacia gum, glycerin, corn syrup, papaya, cranberries, corn oil, ground limestone, dicalcium phosphate, whole powdered egg, canola oil, dates, pineapple, mango, peanuts, hydrolyzed soy protein, iodized salt, citric acid, choline chloride, carrageenan, dl-methionine, mixed tocopherols, calcium propionate, Vitamin E supplement, manganese oxide, ascorbic acid, niacin supplement, zinc oxide, manganese proteinate, zinc proteinate, carotene, d-calcium pantothenate, biotin, riboflavin supplement, sodium selenite, cupric sulfate, menadione sodium bisulfite complex, copper proteinate, pyridoxine hydrochloride, Vitamin A acetate, thiamine mononitrate, Vitamin B12 supplement, Vitamin D3 supplement, and folic acid.